Service Spotlight: Waterjet Cutting | KLH Industries Inc.
Waterjet cutting is the process of slicing through materials with a pressurized jet of water. 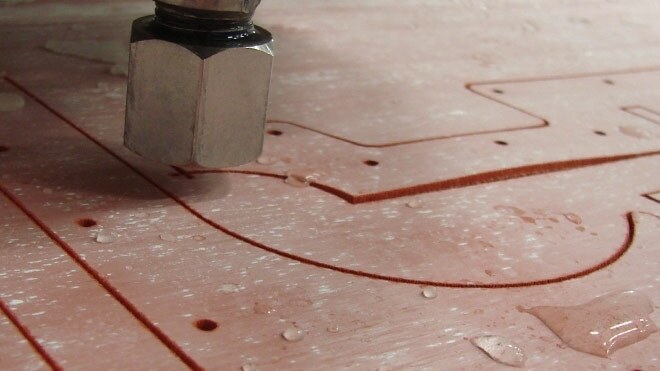 KLH offers water only as well as abrasive waterjet cutting, which mixes water with a sand-like garnet to increase cutting thickness and accuracy. In abrasive waterjet cutting, the water stream propels the garnet, but the garnet does the actual cutting. The process is similar to natural erosion, but is greatly intensified. Since waterjet cutting uses natural substances – garnet (crushed rock) and water – it is considered a “green” technology. This process exemplifies a common trade off in manufacturing. Waterjet cutting cannot hold tolerances as accurately as wire EDM or CNC milling, it is considerably more cost-effective for parts that do not require tight tolerances. Additionally, waterjet cutting has virtually no limits for materials: rubber, cork, glass, marble, concrete, titanium, and much more. As a versatile and accurate process, waterjet cutting has proven cost-effective for every industry sector. KLH utilizes multiple abrasive waterjets and over a decade of waterjet experience to provide accuracy, fast delivery, and high-volume turnaround, all resulting in the most cost-effective process available. Not only can the waterjet department turn most request for quotations (RFQ’s) in less than 24 hours, but with three shift capability, can possibly turn your parts just as quickly. For more information about capabilities or when to use this service, visit waterjet cutting, or contact the waterjet manager.